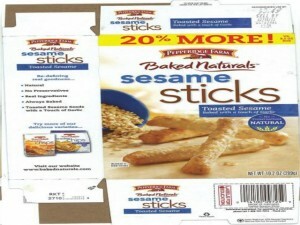 Connecticut-based company Pepperidge Farms is recalling a limited number of “Baked Naturals Sesame Sticks.” The products are being recalled as they might contain pieces of thin wires. The recalled products are packed in 10.2-oz boxes and are marked with a “20% More!” banner printed in yellow. This banner can be found on top of the box. The code along with the date is also printed on the top part of the box, on the flap. Pepperidge Farms emphasizes that only the sesame sticks with the specified codes are affected by the recall and not the rest of the company’s products. About 13,000 cases of these recalled sesame sticks have been distributed all over the United States. No recalled product has been distributed to Canada. There have already been a few consumers who reported getting minor scrapes around the mouth, and even inside it, after eating some of the recalled sesame sticks. The company advises consumers to check if they have bought the recalled product by checking its “sell by” date. If the date falls between 11/20/2011 to 1/1/2012, most likely the Pepperidge Farm sesame stick is included in those that are being recalled. Consumers are urged to bring the product back to the store where it was bought in order to be given a refund. Consumers with questions about the product or the recall can call Pepperidge Farms at 866-535-3774 on weekdays, from 9 AM to 5 PM Eastern Time.